It seems like the number one skincare question that people ask is “How do I get rid of my oily skin? !” Those with oily complexions hate their overactive sebaceous glands and are constantly whining and wishing they had less oil on their face. We get it. And don’t worry, this article will teach you all about the ways you can quell and manage your oily complexion. But first, lets learn about why our skin is oily — and why having an oily skin type isn’t as terrible as you think! Why do some people have such oily skin? It all starts with your sebaceous glands, tiny glands in your skin that secrete an oily, waxy substance known as sebum. Yep, it’s that white, sometimes brown-ish stuff that comes out of your pores. And despite your initial reaction of thinking that sebum’s existence is pesky and intrusive, this natural oil actually does a lot of good for your skin. For starters, it coats your the skin’s top layer to protect it from bacteria. It prevents moisture loss, meaning your skin and body stay hydrated, plus it prevents excess moisture from entering your skin (aka the reason you can go swimming and bathe yourself). But our favorite sebum fun fact is that it’s a natural anti-aging agent — oil prevents wrinkles from forming as quickly. No matter how active or inactive, sebaceous glands are also home to hair follicles, which are tasked with the job of helping the sebum oil rise to the surface and escape our pores. Alas, as many of us know from countless attempts, the sebum does not always want to come exit the hair follicle. And when this process fails, aka the sebum gets trapped in the hair follicle, it becomes a blackhead or a whitehead. If bacteria gets into the mix, it becomes a red, angry pimple. Just how much oil is produced by your sebaceous glands will depend on how large they are, and this can be determined by far more than just heat and humidity (or other weather-related conditions, for that matter). In fact, your genetics may influence their size! This, along with hormonal changes, stress and diet and exercise habits, can then affect how much oil they produce. We hear you — having a shiny face is annoying, especially when you’re wearing foundation or taking lots of selfies. Here are some actually effective ways to help keep your skin shine free. When you’re feeling extra oily, it can be tempting to lather on face wash more frequently than twice a day. You might assume this will taper your oil production, but in fact it does the exact opposite. Over-washing does strip your skin of all that oil, but that then triggers your sebaceous glands to respond by… making more oil. In other words, you’re left with an even higher level of sebum overproduction. That said, you should wash your face twice a day, but make sure the cleanser your using isn’t overly drying or stripping your skin. If you get stuck with oil overload mid-day, these blotting papers can seriously come in handy. They usually come in tiny packets that fit right into your purse, and are designed specifically to absorb excess oil without messing up your makeup. The most satisfying part is seeing how much oil they’ve soaked up once you’re done! Or, try a translucent or slightly tinted powder. There are tons of powders out there — some may be translucent or even white, which will help to neutralize your shiny complexion. We also love powdered SPFs because they do double duty: They apply right over your makeup and give you extra protection from the sun. Now, fine-tune your skincare regimen. To rock flawless skin — that no weather pattern can’t wreck — you need a dream team of skincare products working on your behalf. Of course, make sure you’re washing your face with a gentle cleanser twice daily. You may even want to try out an oil-based cleanser, which acts like a magnet to pull excess oil out of your skin. You should be using a chemical-based exfoliator once or twice a week to rid your skin of dead skin cells. Try adding an alcohol-free cleansing toner into your routine. 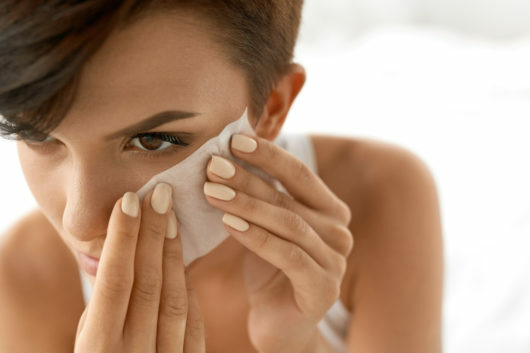 This will minimize the appearance of large pores and make sure all of the makeup, bacteria, and pollutants you encountered throughout the day is really off your skin. If you have extra oily skin, a detoxifying mask can help nourish the skin without over-hydrating and also help reduce inflammation. We also love clay and charcoal masks, which really deep-clean pores, pulling all the sebum out to the surface so it doesn’t seep out during the day. Make sure you are always wearing SPF during the day, no matter the weather (yes, even when it’s cloudy!) SPF is a must. But be sure to look out for the ones that say “oil-free,” as these won’t add any shine or cause breakouts. If you’re a makeup-wearer, try incorporating an oil-free foundation, primer, or tinted moisturizer that also boasts SPF. Now, find a facial oil to use in place of your night cream. Okay, remember how stripping your skin of oil actually makes your skin overproduce oil? Well, using a facial oil tells your skin that it’s got plenty of oil and, if you’re lucky, will help to quell sebum production. They also help give you a healthy glow, can unclog your pores and fight off breakouts. A great night time oil for your skin is Hyaluronic acid, because it holds 1000x it’s weight in water and has Squalane, a deeply penetrating, moisturizing ingredient. Hyaluronic acid helps to hydrate, moisturize, and plump your from the inside out overnight. The trick is to stick to natural oils that are specifically formulated for oily and acne-prone skin. Lighter oils, like jojoba and apricot, are ideal for oily skin, especially in the summertime. Aloe vera, tea tree, lavender, and ylang ylang essential oils are all great, and can be mixed with jojoba or apricot oils. Hey, thanks so much for the great post! Is it ok to use an oil (such as mineral oil) over acne treatments in the evening? I currently use isotretinoin (topical – brand name Isotrex) in the evening, and moisturisers don’t mix well with it and can pill up. Is it ok to use an oil to moisturise instead? Will it be hydrating enough? As it’s only an occlusive, and isotretinoin is quite drying. Also do you have any lifestyle tips on how to reduce oil production? Could you mix a half a tsp of apricot or jojoba oil with a couple drops of essential oils?